Cardinals are beautiful birds that can be seen and heard year round. Their magnificent color and overall friendly behaviour make them one of the most desirable birds to have in your garden. Thankfully, no matter your level of experience, cardinals are extremely easy birds to attract into your garden environment if you take the right steps. Northern cardinals love to eat large seeds, with safflower seeds and black oil sunflower seeds being their favorite. They also enjoy peanut pieces, cracked corn and fresh berries. The best way to store these foods is to get a wide feeder which will allow sufficient room for the bird to perch. There are a few different bird feeders for Cardinals to choose from so we have picked out the best three options. This is by far the premium material to use for a bird feeder. Most products are only made out of wood or plastic which can be easily chipped and broken, while metal will provide you with a long lasting product. Metal is also much easier to clean and can even be put in your dishwasher for quick and easy cleaning. 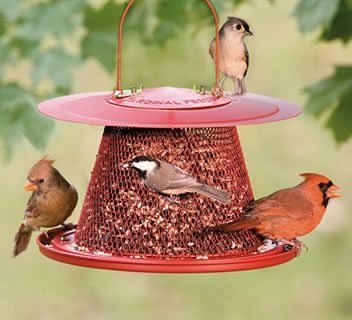 This feeder allows you to fill it with more than 2.5 pounds in black oil sunflower seeds, cardinal’s favorite food. The large capacity means that you won’t have to be constantly filling up the feeder with new food. The feeder is large enough to cater for 15-20 birds at a time. This means that more birds will be attracted to your garden and it also allow for a large capacity. The feeding area is perfect for birds that wish to hang or perch when feeding. food from the rain and snow. The feeder itself holds a large quantity of material so you don’t have to be constantly refilling it. One of the most important factors to look at when buying a feeder is durability; metal feeders are top of the list when it comes to length of life. If you have had problems with squirrels in the past when using wooden or plastic feeders, don’t worry, they will struggle to cause any damage to this feeder thanks to the metal construction. The screen wires are very narrow and tight which means that cardinals sometimes have trouble getting access to larger seeds. While this is helpful when preventing other animals from eating the food, it means that cardinals will not have an easy time obtaining their own favorite food (black oil sunflower seeds). Just like the name suggests, this product is the best around when it comes to preventing squirrels and other similar sized animals from damaging the feeder and taking food from it. This is achieved thanks to the seed ports. 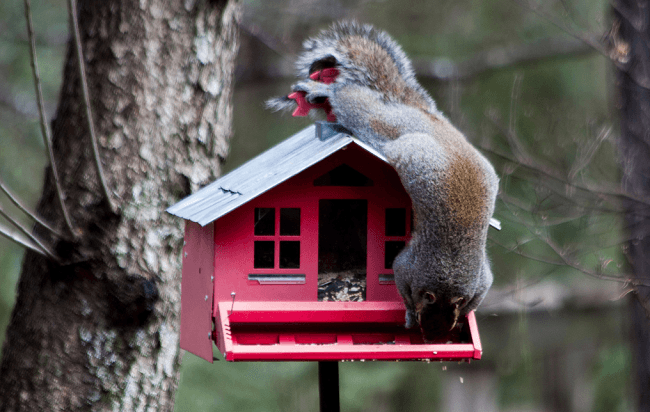 When a squirrel climbs onto the feeder, its weight will automatically force it down and close the entrance to the seed ports. This means that the squirrels will also not be harmed in the process of preventing them from eating the food. If you want to tailor the feeder to a specific size of birds, you can do just that. Some feeders allow larger birds to eat a lot of the food and will leave nothing for the smaller birds such as cardinals. In order to change the settings, you simply twist a dial which will lower the weight that is needed to tip the perch and close the seed ports. This product is easily dismantled and put back together which allows for easy filling. You can also pop it into the top rack of your dishwasher to make the cleaning process quick and easy. This bird feeder for cardinals has a huge capacity. The height of it can be easily adjusted and you can clean it by using your dishwasher. This product provides the best defence against invasive animals such as squirrels, thanks to its smart, adjustable settings. This is the feeder for you if you suffer with these problems. The main drawback of this product is that it is not sufficiently waterproof. This means that the food will get soggy and easily smashed into the cracks and crevices. This leads to constant cleaning and replacement of the food. If you live in a wet climate, this may not be the right product for you. Being made out of glass, it is a product that is very straightforward to clean. All you need is some warm water and a cloth to make the feeder look like new. Most other materials smudge over time and make the appearance look faded and worn. It has enough room to store 30 ounces worth of food and it also has six individual feeding ports which allows for many birds to use the feeder at one time. Being made of glass, this feeder is extremely easy to clean and doesn’t suffer from the types of appearance issues that other materials do. It has a perfectly sized perch and an adequate reservoir capacity. These products are easy to handle and will keep the food fresh for longer. If you plan on using a feeder in a patio or concrete area, this is not the product for you as the glass is easily breakable and the wire hanger is flimsy. You don’t want to be constantly replacing your feeder, especially if you live in a particularly windy environment.